"...There are Pretenders among us..."
"The Pretender" airs on NBC on Saturday nights. If you've seen the show, you already know how entertaining and thought-provoking the episodes are. If you've never seen the show, or haven't watched it in so long that you don't know what the heck is going on, feel free to use this site to educate yourself about the series, its background story-line, and its cast of characters. 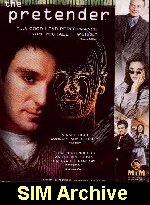 Then join the over thirteen million viewers in the US who have already been captured by "The Pretender". 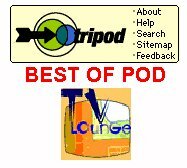 This archive contains in-depth recaps of the second season episodes of "The Pretender"-- and will be displaying in-depth recaps of the third season episodes as they are aired -- and also allows you access to other Pretender and Michael T. Weiss related sites. LEGAL JUNQUE: All written synopses are the property of the webmistress, unless specifically noted otherwise, and are covered under the auspices of Copyright, 1997, 1998, MKHanson. All Rights Reserved. All images are the property of the original film makers and are reproduced here under "fair use" only to promote "The Pretender" and to entertain the fans of Michael T. Weiss. Photos are not for sale, and cannot be mass-produced, so please don't ask. 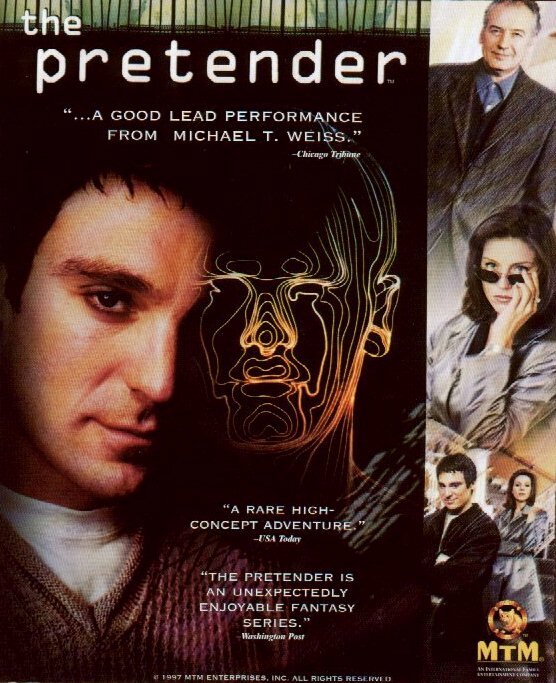 JARODSTWIN RED FILES: The pages listed below will take you to the detailed recaps of the episodesof the Third Season of "The Pretender", as well as images and reviews of each episode as it airs. LITTLE RED NOTEBOOK Sites listed below will take you to detailed recaps of the episodes of the Second Season of "The Pretender", as well as images and reviews of each episode. NOTE: Because the pages contain so much text and so many graphics they may take a while to load properly. Episodes 1 to 8: This notebook includes the following episodes: Back from the Dead Again, Scott Free, Over the Edge, Exposed, Nip and Tuck, Past SIM, Collateral Damage, and Hazards. Episodes 9 to 16: This notebook includes the following episodes: FX, Indy Show, Gigolo Jarod, Toy Surprise, A Stand-Up Guy, Amnesia, Bulletproof, and Silence. Episodes 17 to 21: This notebook includes the following episodes: Crash, Stolen, Red Rock Jarod, Bank and Bloodlines. CLICK on the image of Jarod (RIGHT) to access the SIM ARCHIVE.Space here has been provided by MrLyle@Tripod so that we can provide you with in-depth recaps and reviews of the First Season episodes of "The Pretender". The button image above is from EMMY magazine, and was used as part of an advertising campaign to get "The Pretender" and its cast members recognized for Emmy Awards. To obtain a full-size image of the Pretender ad shown, go to the EMMY PIC link. CLICK on the image of Jarod to the RIGHT to access MARE'S PRETENDER PAGE at America On-Line where you can read a brief overview of the series and characters to date, link up to other Pretender sites, and see some extra images. CLICK on the image of Jarod to the RIGHT to access our LINKS page. This will provide you with access to other Pretender and Michael T. Weiss sites, all hand-picked and eviewed by the webmistress. These are only the best sites we've found thusfar. New sites are added whenever the webmistress is made aware of them. 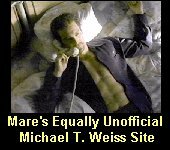 CLICK on the image of Jarod to the right to access MARE'S EQUALLY UNOFFICIAL MICHAEL T. WEISS SITE FOR OBSESSIVE FANS. This is a sister-site to the Jarodstwin Archive, and allows fans of Weiss to see him as he appeared in other television shows and motion pictures, and in TV interviews. You'll see him in "Freeway", "Mary Higgins Clark's Remember Me", "Jeffrey", "2000 Malibu Road", "Days of Our Lives" and "Dark Shadows", among others. There is also a small Gallery of images that changes periodically. Click on the moving image of Jarod to access the Michael T. Weiss in Motion site. For more animated GIFs and movie-style (.AVI) animations of Weiss, see also Steve's MICHAEL T. WEISS ANIMATION GALLERY at Geocities. Steve's gallery may be extending into Tripod over the next several months, so stay tuned for future developments there. CLICK on the image of Jarod to the right to access MISSY'S PRETENDER MESSAGE BOARD AND CHAT ROOM. This is a fan-made, fan-maintained bulletin-board style style that also gives fans access to a private chat room where they can discuss "The Pretender" and its stars, exchange information, and express their opinions. When you post a message to the board, make sure you use your e-mail address, or the system won't recognize your post. CLICK on the image of Jarod to the right to access THE PRETENDER'S ARCHIVE @ Fortunecity. This is one of the most comprehensive Pretender websites we've found, and it's unique in that gives detailed background information on all of the characters in the show, from Jarod to the janitor at NuGenesis. This site also features an entire page dedicated to MISS PARKER so her fans can see and read about her. The Jarodstwin Archive is proud to be a member of MT.WAS, The Michael T. Weiss Appreciation Society. For information on how to join the society yourself, CLICK on the image to the right. The Jarodtwin Archive is also making available an award for outstanding celebrity fan sites. Not everyone gets this award; we're pretty finicky about who it goes to, but to find out how your own site might be elligible for this award, and to visit the sites that have already received it CLICK on the image of the award to the LEFT. Thank you for your visit to my website. Before you go, please sign the guestbook. Click on the image of Jarod or check out the Listing below. owned by The Shastaclan Observatory. Want to join the Fans of Michael T. Weiss Webring? Pretenders, Cleaners, Triumvirate Members and Sweepers have visited this archive.